Lucy Noakes is a Reader in History at the University of Brighton. She will talk about the social impact of the ‘Great War’ of 1914-1918 in Lewes and in Sussex. It shaped the lives of almost everyone in Britain, leaving in its wake a society shaken by the enormous loss of life, and by the huge social, political and cultural shifts it brought about. Women were employed, often close to the front line, in huge numbers; air raids had, for the first time in British history, killed and injured civilians; rationing had been introduced; the franchise had been extended and war memorials could be found in almost every British city, town and village. Sussex played a key role. It was home to many camps housing soldiers from around the Empire to hospitals for the war wounded, and it also accommodated refugees from occupied Belgium. This postcard, offered on ebay, shows the Steam Laundry that stood at the top of Malling Hill, by Mill Road. The website of Historic Lewes (Lewes, Delaware) reports excitement at the bequest to them of two 18th century Lewes portraits, which became the earliest known examples of portraits of Lewes residents in their collection. The portraits had been purchased at auction in New York in the 1960s by a resident, and donated in 2010. 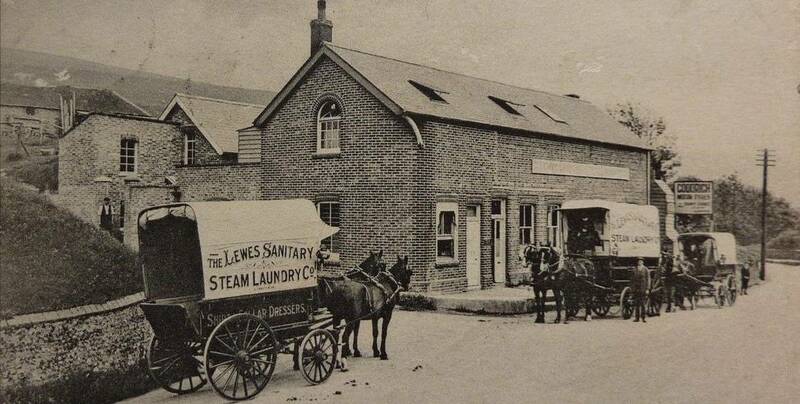 One had written on the reverse “James Moore of Lewes, Del. June 1789, aged 22, born 1864 and died 1820”. The other, of much higher quality, featured Susan Moore his mother, who died in 1821 aged 82 or 84. The attribution was added by Mary S. Moore, when bequeathing portraits of her father and grandmother to a cousin in 1867. Historic Lewes comment that when the works were taken to the Smithsonian museum for investigation the portrait of Susan Moore was considered particularly fine, and painted in an English manner. Sadly for Historic Lewes, James Moore of Lewes was a resident of Lewes, England, not Lewes, Delaware. To the Victorian spinster Mary Surgey Moore, his only daughter, the abbreviation “Del.” meant “delineavit” or drawn, not “Delaware”. The James Moore depicted is the surgeon to whom the young Gideon Mantell was apprenticed, and who he later joined as a partner. Mantell records much information about his friend and mentor, including his retirement following an attack of apoplexy in 1818 and his death following further attack on 30 August 1820. James Moore was buried in St Michael’s cemetery on 7 September 1820, his age recorded as 53. His only daughter, Mary Surgey Moore, moved to Ryde, Isle of Wight, where she died in 1876. James Moore’s father was also called James Moore. He was a prosperous Cliffe butcher who also acquired a farm in Ringmer (Norlington Gate Farm), later inherited by both his son and his granddaughter. This postcard, postmarked from Lewes on 19 November 1918, was described as a Great War medal ceremony when the card was offered for sale on ebay recently. 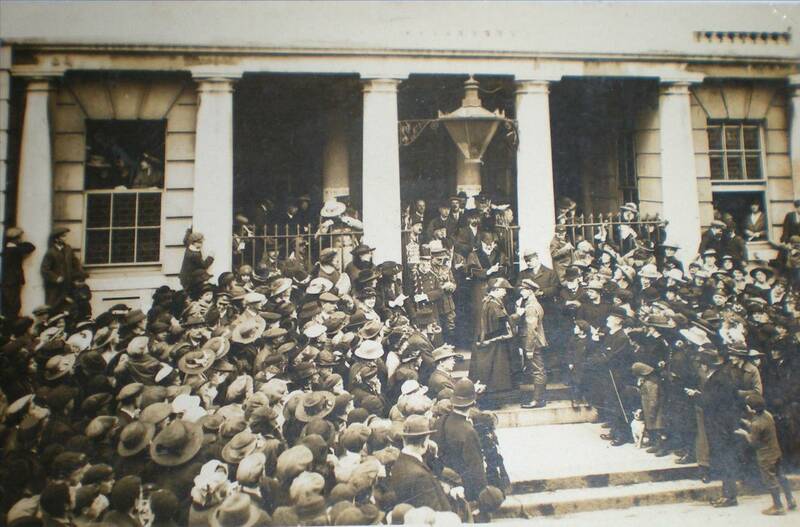 The awards were apparently made by the mayor on the steps of County Hall. Samuel Hillman, aged 50, was buried at Cliffe on 8 October 1842. The following week’s Sussex Advertiser includes an account of the inquest held at the Snow Drop Inn “on view of the body” at which the witnesses included Thomas Wymark, landlord of the Snow Drop, who said that he had known the deceased, a barge-master and collector of the tolls for the Lower Ouse Navigation, for some years. He had seen him go into the chalk pit near his inn about 10.30 a.m., and go up to the stable building therein. The same newspaper also included an account of the regular and tetchy sessions about which householders were qualified as electors – each party attempted to disqualify as many of the opposition voters as it could, while promoting the cases of dubious supporters. This noted simply “Samuel Hillman dead – name struck out”. The Hillman family played a leading role in the commercial life of the Cliffe, and another branch of the family ran the chalk quarries in which Samuel died. Samuel Hillman had married Rebecca Colwell, a young widow, at South Malling church in 1822, and the marriage was followed by at least nine baptisms of their children at Cliffe church between then and 1840. Cliffe was the church where Samuel himself had been baptised. His eldest son Edward, a young teenager in 1842, was articled within a few year to the law firm founded by John Webb Woolgar, and rose to become its principal. Edward Hillman was an important figure in the town, and was mayor of Lewes in 1892. His law firm was variously known as Hillman & Sons; Hillman, Hillman, Vinall & Carter; and Wynne Baxter, Hillman & Carter until well within living memory. The firm itself continues in Lewes, though recent mergers have resulted in the Hillman element being dropped from its title. 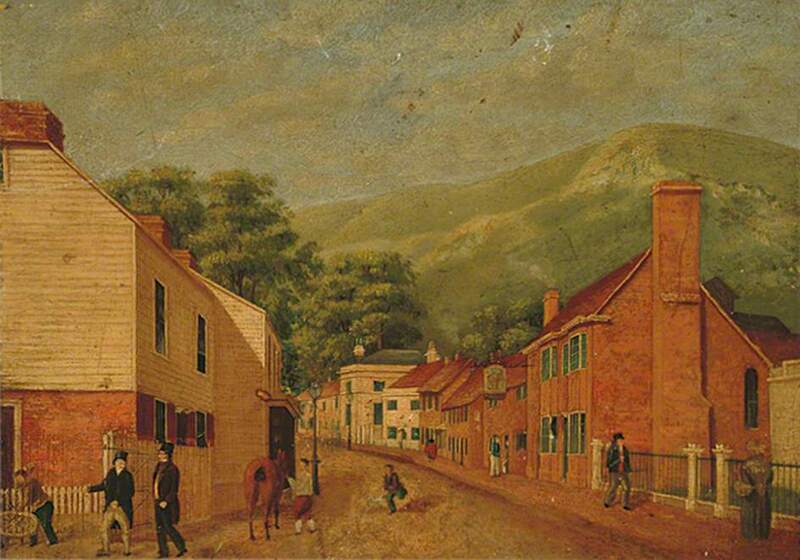 This lovely painting of Malling Street is from the Sussex Archaeological Society collection, and posted on the BBC website. The artist is unknown. The view is a little earlier than that shown in the postcard included in Bulletin no.51. The large brewery building has not yet appeared, but the other houses match well. The painting is reproduced here with SAS permission. Now on my sixties, I distinctly remember as a child that when travelling with my parents from Lewes to Newhaven my father pointed out to me an old building in a field quite close to the road near Southease or Rodmell. He assured me that the building had been a German POW camp. In spite of my efforts scouring the internet, I am unable to find any reference to that camp. It isn’t even listed in the official UK prisoner of war camp list. Can anyone throw any light on the subject? If so, please contact tonyrich50 [at] hotmail.com. This entry was posted in Biographical Literature, Economic History, Lewes, Local History, Military History, Transport History. Bookmark the permalink.